Before building the cocktail, make sure the orange juice and Perry are both well chilled. 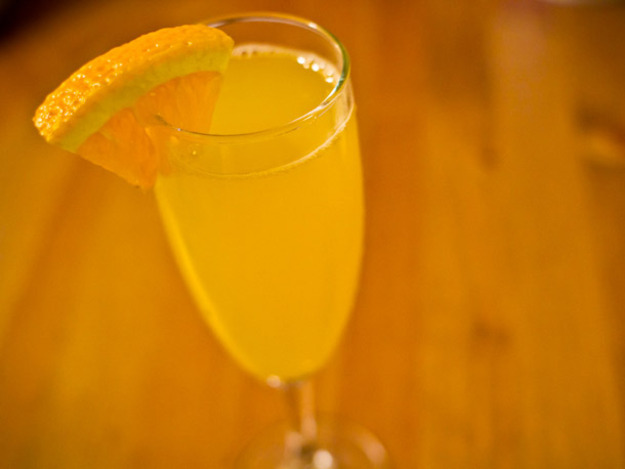 Pour 90mls of orange juice into Champagne flute. Add ginger liqueur to the orange juice and stir well. Tilt the flute on an angle and fill with 90mls Perry. Gently stir, garnish with orange wedge, and serve immediately. Place the first cup of Perry on the stove and bring to a boil and boil until reduced to ¼ cup. Set aside to cool. Core and peel the pears and then cut each into 16 slices (fewer slices if using smaller pears). Have a bowl of water that has a whole lemon squeezed into it. Place pears into water and then onto a plate to dry and set aside. This will keep them from turning brown. Measure out cream and add cooled reduced Perry to cream. With the mixer on low, alternate adding the flour mixture and the cream/perry mixture until well combined. Scrape sides and mix until smooth. Grease a 9X9 square pan liberally with butter and pour in the batter. Arrange the pears, outer edges up into the top of the batter. Place the second cup of Perry on the stove as before only reduce down to two tablespoons. Watch it that it doesn’t evaporate too far. Place the icing sugar in a small bowl and add the reduced Perry along with one tablespoon of milk or cream and stir. Add the last tablespoon of milk or cream a little at a time until desired consistency. It should be thick but runny enough to drizzle off the end of a spoon. Whisk Perry, cane juice or sugar, and cinnamon stick in a 4L saucepan over medium-high heat; bring to a boil, and cook, stirring occasionally, until reduced to 2⁄3 cup, about 25 minutes; remove from heat and discard cinnamon stick. Stir in milk and cream until smooth and then add ground cinnamon and egg yolks; whisk until smooth. Return saucepan to medium heat and cook, stirring often, until mixture thickens and coats the back of a spoon, about 20 minutes. Pour custard through a fine strainer into a medium bowl,and let cool; refrigerate until chilled. 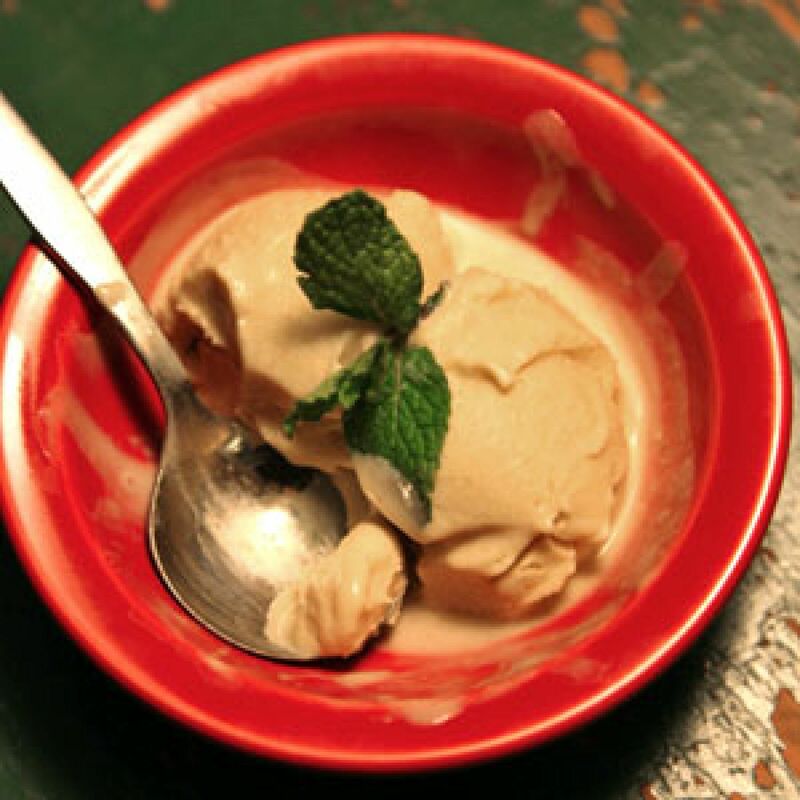 Process chilled custard in an ice cream maker according to manufacturer’s instructions. Transfer to a storage container and freeze until firm, at least 4 hours. For the poached pears, find a saucepan large enough to fit the four pears snugly. Add the Perry, sugar, ginger, cloves, cinnamon stick, chilli and cardamom to the pan and bring to the boil, then remove the pan from the heat. Add the vanilla pod, vanilla seeds and pears to the pan, making sure the liquid covers the pears completely. Cut out a circle of greaseproof paper a little larger than the diameter of the pan. Place the circle over the pears, pressing it down so that it fits inside the pan. Return the pan to the heat and bring the mixture to a simmer. Continue to simmer for 35-45 minutes, or until the pears are just tender. Remove the pan from the heat and set aside to cool, then chill the pears, in their syrup, in the fridge, overnight if possible (they will keep for 1-2 days). 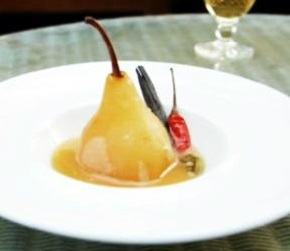 When ready to serve the pears, strain 200ml of the cooled syrup into a pan (discard the collected vanilla pod, cardamom pods, ginger and cinnamon stick). Bring the syrup to the boil, reduce the heat until it is simmering and continue to simmer until the liquid has thickened to a gloopy syrup and reduced in volume by half. Whisk in the whipping cream and cook to heat for a further 1-2 minutes. Just before serving, sprinkle over the salt crystals. 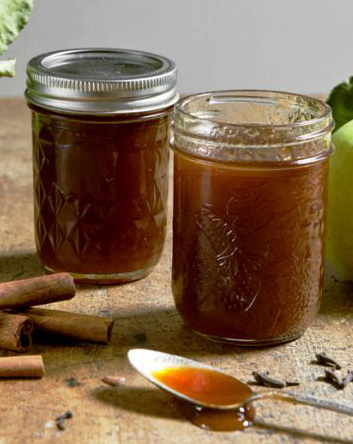 To serve, carefully remove the pears from the remaining syrup. Slice the bottom off each pear so that each can be stood upright on a plate. Spoon over a tablespoon of the remaining poaching syrup. 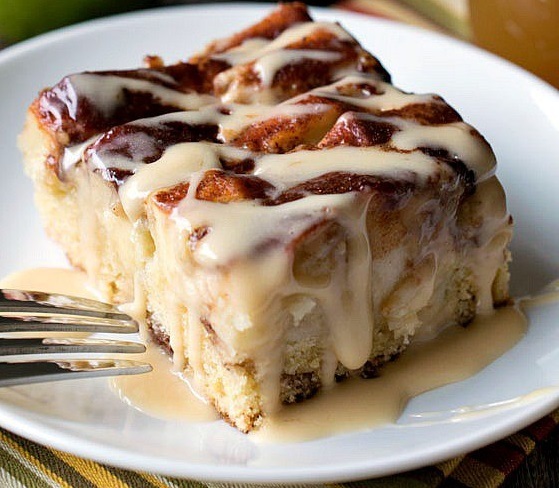 Drizzle over the salted caramel sauce. 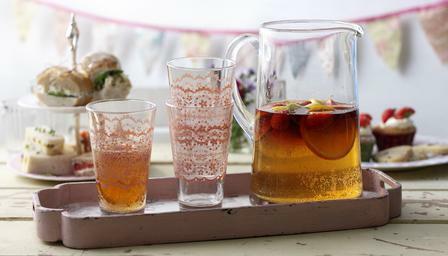 Add a couple of straws and the mixed fresh fruit pieces, then gently pour the Pimms on top of the cider to create a separate layer. Whisk together flour, mustard, zest and salt in bowl; add butter and using your fingers, rub mixture until pea-size crumbles form. Add lemon juice and 7 tbsp. ice-cold water and stir with a fork until dough just comes together. Transfer to a work surface and form into a ball; halve and form each half into a disk. Wrap disks in plastic wrap and refrigerate for 1 hour. Meanwhile, bring a 4L saucepan of water to a boil; add potatoes and cook until tender, about 6 minutes. Drain, and mash until smooth; set aside. Heat oil in a 4L. saucepan over medium-high heat. Add pork and cook, stirring, until no longer pink, about 4 minutes. Add garlic, onions and carrot, and cook, stirring, until soft and pork is well browned, about 20 minutes. Add Perry, celery seed, cloves, nutmeg, cinnamon, ginger, bay leaves and pepper, and cook until all liquid is evaporated, about 3 minutes. Remove from heat, and stir in mashed potatoes; let filling cool completely. Heat oven to 400°. Place 1 dough disk on a lightly floured work surface and using a rolling pin, roll until ¼ inch thick. Transfer to a 9 inch pie dish and let excess hang over edge; pour filling into pie dish and smooth top. Roll remaining dough disk until ¼ inch thick and place over filling. Trim dough sheets to within 1 inch of edge of pie dish, fold edge underneath itself and crimp with your fingers or a fork, if you like. 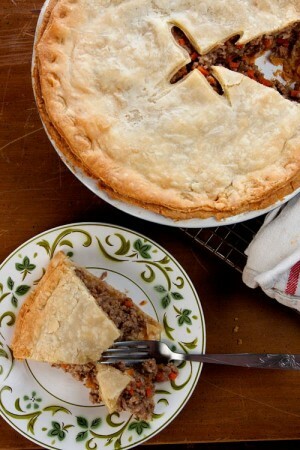 Brush with egg wash and using a paring knife, cut four 2 inch slits in the top of the pie. Bake until pastry is golden brown and filling is heated through, about 50 minutes. Whisk flours, 2 tsp. cinnamon, baking powder, soda and salt in a bowl; set aside. In the bowl of a stand mixer fitted with a paddle attachment, beat butter and 1⁄2 cup sugar until fluffy. Add yolks, vanilla, Perry and buttermilk; mix until smooth. With the motor running, slowly add dry ingredients and mix until a soft, sticky dough forms. 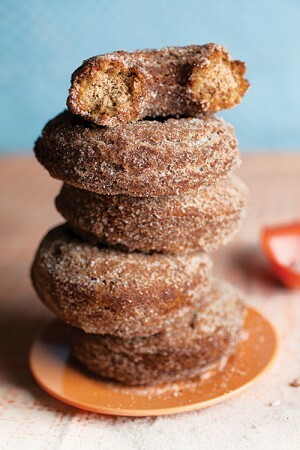 Combine remaining cinnamon and sugar in a bowl; set aside. Heat 2 inch oil in a 6L saucepan until a deep-fry thermometer reads 350°. Using lightly oiled hands, roll about 1⁄4 cup batter into a loose, sticky ball; pat gently into a disk. With your thumb, make a 1 1⁄2 inch hole in the center of dough; carefully slide into oil and fry, flipping once, until golden, 3–4 minutes. Using a slotted spoon, transfer to a baking sheet with a wire rack; repeat with remaining dough. Let donuts cool completely; toss in cinnamon-sugar mixture. In:Foodie Friday, Friday Shake Up! Bring Perry, cinnamon, cloves and allspice to a boil in an 8L pot over high heat; reduce heat to medium and cook until Perry is reduced by half, about 1 ½ hours. Add sugar and cook, stirring occasionally, until reduced to 4 cups, about 1 ½ hours (You want to cook it no higher than 218°F. If you cook it beyond that temperature, it will set into jelly). Let it cool in the saucepan, strain, discarding spices and store in the refrigerator up to a month; alternately, divide among prepared half pint jars, apply clean lids and rings and process jars in a boiling water bath canner for 10 minutes. When time is up, remove jars from canner and let them cool completely before handling. Heat 2 tbsp. each oil and butter in a 12″ skillet over medium-high heat. Season pork on both sides with salt and pepper and dredge half the pieces in flour; add to skillet and cook, turning once, until lightly browned on both sides, about 1 minute. Transfer to a plate and set aside; repeat with 2 tbsp. 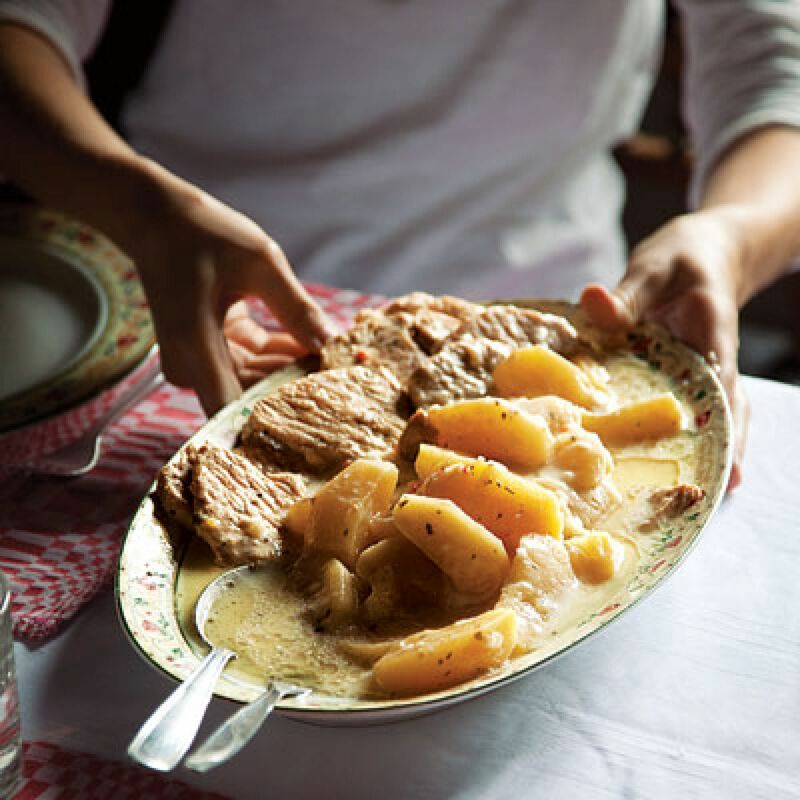 oil, remaining butter and remaining pork and flour; transfer all pork to plate. Return skillet to heat and add remaining oil; add pears, garlic, onion and chile, and cook, stirring occasionally, until soft, about 3 minutes. Add Perry and cook until reduced by half, about 5 minutes. Add stock, cream and mustard, and bring to a boil; return pork to skillet, and add marjoram. Reduce heat to medium and cook until pork is cooked through and sauce has thickened, about 3 minutes. Season with salt and pepper and sprinkle with parsley; serve with rice. few thyme sprigs, leaves picked, about ½ tbsp. Heat the oil in a large lidded non-stick pan (we used a wide, high-sided frying pan) and cook the chicken for 3-4 mins on each side until browned. Remove with a slotted spoon, then add the onions to the pan. Cook for 3 mins, then stir in the garlic and cook for 1 min more. Pour in the Perry and bring to the boil. Return the chicken to the pan, cover with a lid and simmer for 10 mins. 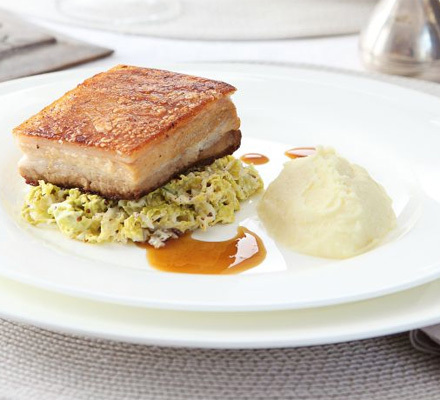 After 10 mins, remove the lid and stir in the crème fraîche, mustard and herbs. Bubble for another 5 mins, then season. 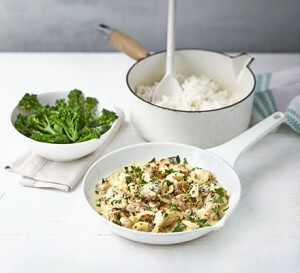 Serve with rice and Tenderstem broccoli.